Artificial Intelligence (AI) is probably the topic right now in computer science. There is a ongoing public discourse whether we’ll see machine overlords in the near future or not. People like Elon Musk spoke of regulating AI to make sure that the human race survives. If you look at the current state of AI and recent breakthroughs you might be inclined to think that those machine overlords are indeed just around the corner. But a closer look at the way AI works, reveals that current AI systems are still far away form achieving human level intelligence. What they do these days, is to approximate human behavior using mathematical models that are derived from huge datasets. This works well in many areas where tasks are predictable to some degree. For example, AI systems where able to match the level of senior experts for analyzing X-Ray images with bone fractures. The power of AI systems stems for their ability to cover a huge search-space to find correct answers. They do this by filtering out the most important signals from data and thus effectively creating categories on their own. To get to the most important signals, they “look” at many examples. Like a path that emerges on a lawn when many people cross it, neural networks adopt their internal connection structure by weighting the nodes that are connected when trained. This is apparently similar to processes on the lowest level in the (human) brain. But the analogy already ends there: we have no idea how higher level functions of the human brain emerge from these simple structures. We can only speculate that with a huge number of connections human intelligence emerges somehow. But there is no solid theory that supports this. For the time being, we are “stuck” with AI systems that are extraordinary efficient in finding patterns and categorizing things. Like with all new technologies, AI is currently applied to many domains. And initial results are truly astonishing. It turns out that many human work related tasks are at its core pattern matching activities. For example, you don’t need to understand medical details of the human body to identify bone fractures. Just by looking at many examples you can identify them (and be really good at it). This forces us humans to think about our work in a completely different way than before. What is the “human” part that cannot (won’t?) be automated? What are the hidden patterns of our tasks that automated (AI) systems can take from us? For example, people who did analysis of stock markets are highly paid professionals. But their jobs are being replaced by AI systems. Why? They were looking for patterns in huge datasets and automated systems are capable of just doing this. This is true for many office jobs that require a college or even university degree. They are at a very high risk of being automated. What we thought requires intelligence and education to master is often something rather mundane at it’s core. 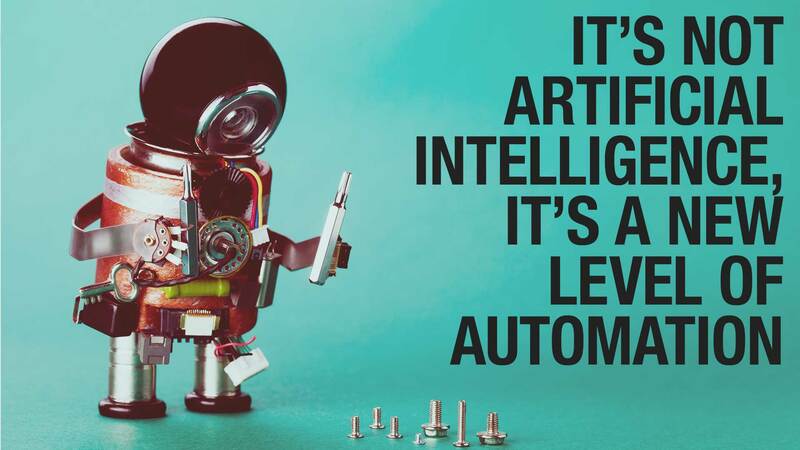 All in all AI systems bring us a new level of automation for tasks that we thought require human intelligence. There is certainly an enormous challenge in front of us to find a way to integrate this new level of automation in the working environment. So why not use AI systems to provide us insights about patterns (about our work)? Aimed with this powerful new tool, we humans can analyze those insights and make decisions. After all, making informed decisions is truly setting us humans apart from AI systems. Posted in Technology and tagged AI, Automation, Jobs, Work.